Delhi, the city of cities! History of medieval India and future of modern India cannot be separated from these five letters “DELHI” . Delhi is situated on the banks of River Yamuna which was considered as a gateway to the Gangetic plain region beyond, in medieval times, thus making it the most important location in North India geographically. 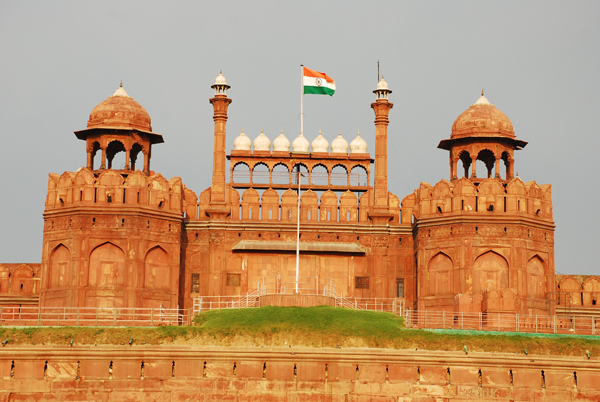 With such a rich heritage, Delhi has become a Tourist Attraction. Delhi has many places which are historically important. If we go in chronological order, First comes Qutub Minar, a 73 Metres tall, magnificent and world’s tallest brick minaret. When you see this Qutub Minar Complex, you get mesmerized by the intricate carvings and architecture used in 13th century. The Qutub Minar itself is so beautiful that one cannot just take their eyes off that beautiful structure. After this comes the most amazing piece of architecture Delhi holds “Tomb of Humayun”. This is the tomb of emperor Humayun Built by his wife after 10 years of his death. This is a masterpiece of the Mughal Architecture. Tourism Department of Government of India has recently renovated the whole complex. This is a beautiful and calm place. And then arrives the most powerful building in Delhi, the mighty Red Fort. This is a Fort which is built by the Emperor Shah Jahan. When you view the entrance of this big Fort you get dazzled by the view. Inside your mind you start imagining that golden period of Delhi. Near this area there is a Chandani Chowk which is famous for it’s Markets. There is “ParanthaGali” where you can have delicious Punjabi dish “Parantha”. Delhi’s cuisines are deeply influenced by Nearby Punjab Region. There are many Punjabi delicacies like “Chholebhature” which can be enjoyed here. On the opposite side of Red Fort, there is a Jama Masjid, a Largest Mosque in India. From the minarets of this mosque you can see whole city of old Delhi in a glance. Then there is a Lotus Temple which is known for it’s amazing infrastructure. After that you can see Akshardham Temple, which is a modern representation of Ancient Temples in India. As all these places are connected with Roads and Metro, it is very easy to access all these places when you are in Delhi. But there are many places in remote areas of Delhi which you should not miss. One such place is Agra. Agra is almost 240 kms away from Delhi. Agra houses the world famous “Taj Mahal”. There is nothing which is enough to describe this ultimate and unique example of architecture. You have to see it to feel it. Fort of Agra which is roughly 2 kms away from Taj Mahal is also very nice example of Mughal Architecture. Another one fabulous place is fortified city of Fatehpur Sikri. This was the Capital of Mughal Empire for a very short period of time. This complex of historical buildings is the most amazing area I have ever witnessed in my life. History and architecture loving folks should never miss this spot. One thing I regretted about this trip was that I had to spent a lot of money for my stay. Although I was out most of the time I had to book room for 24 hrs basis. And as I had spent so much money, I had an obligation to come back there. But after I heard that there is a website Frotels.com which can book rooms in hourly basis, I thought I should have known it before. I might have spent relatively less amount than I actually did as I had to spend my night in Agra as it was too late to go back to Delhi. I had to pay full day charge for 6 hrs. for which I was actually there. This is also very useful for businessmen visiting for short time, musicians on a tour. Many who are traveling by connecting flights from Delhi can refresh themselves in the time between the flights instead of waiting at airport. Seeing all these I have decided to use Frotels in my next trip to Rajasthan. I guess you have already decided the similar, haven’t you?